As I wander through on-line collections, occasionally I spot things that look very familiar. There are pattern style families, even specific motifs and strip designs that persist over time, popping up in multiple locations, over periods of decades. Those are fun to trace, and to try to figure out branching traditions, and to try to pinpoint ultimate origins, although that’s rarely possible. Today’s pieces though are something different. I believe them to be either part of the same original artifact or set of artifacts. To begin with, here they are. At left is a piece from the Art Institute of Chicago (accession #1907.740); at right is a piece in the Hermitage Museum’s on line collection (accession #T-2734). 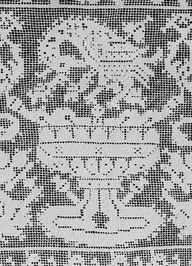 The AIC’s piece has a more complete annotation, noting the dimensions of the various component parts, describing the materials and stitches used (“long armed cross stitch, cut and drawn thread work… insertion of silk needle lace”), and giving a provenance and date of Italy, 1601-1650. They call the piece “unfinished.” It was acquired by the museum in 1907. The Hermitage’s piece provides less detail, silk on linen, and overall dimensions. They call the stitch used “double Italian cross” (or that’s what the Russian translates as). They cite origins as Italy, 16th-17th century, and say the piece came to them from the private collection of Baron Stieglitz. I am unsure which member of that family they are citing, but the the Stieglitzs were prominent bankers and aristocrats during the 1800s, and up to the time of the Russian revolution. They were known for amassing opulent art and antiques collections, among other extravagances. When my Stealth Apprentice brought the Russian-collected example to my notice last year, she opined that it was unusual to see the very coarse voided strip, needle lace, and more delicately done center piece all in one composed work. I agree with her. It is curious – all the more so because of the second example from Chicago. Further, because both artifacts include an intact right hand edge with no seaming, these were probably descended from a set of two matching items. Both pieces seem to have been cut off at the right edge, snipped through the narrow needle lace strip, and both show signs of stitching remains on their bottom edge – possibly fragments of more needle lace. On the Russian bit, there’s even evidence of red remnants along the outer edge of the applied border strip. 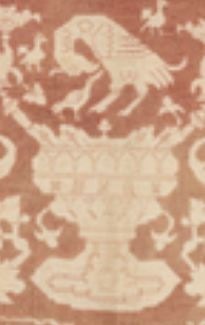 Both works show clear signs of there being a finished hem around the central flower/urn plus companion border section; but no hem is in evidence on the voided strips. 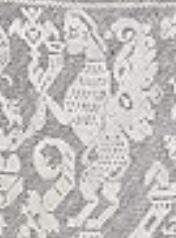 Even the linen ground’s weave on the voided strip parts looks coarser than that in the center area’s ground. Here’s one possible flight-of-fancy. I have no evidence to claim this as being true, so it’s just postulation and theory: two rounds of re-use. Our piece starts off as the urn/flower part – two strips, about 42.3 cm (16 5/8 in) tall, but of an indeterminate length. 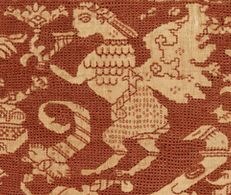 They might have been bed hanging, long towels, or something akin in shape or proportion to a modern table runner (historical use unknown). Fast forward to the second moment of re-use… The second-use bed hanging or bolster cover is cut down again. The unknown recycler may have intended to make multiple covers for smaller cushions, or other smaller covers/bags/whatever. And it’s possible she or he never finished that project – that’s why we have the partial cut-down-and-reassembled Hermitage fragment, and the unfinished fragment in Chicago. And for the piece’s final disposition among multiple museums – I do know that in the late 1800s, lace and embroidery collecting was a fad among the wealthy and fashionable. Many American museum textile collections crystallized around donations from prominent families – items they picked up on Grand Tours of Europe. I have come across quite a few artifacts that may be pieces sundered in that process – cut apart by antiquities dealers who then sold smaller bits to multiple buyers, rather than keeping artifacts intact and making only one sale. I posit that our flower/urn twins are a pair of those pieces, and having fallen victim to profitable multiple sales, ended up fragmented between two continents. Sorry folks. This has nothing to do with anyone’s search for companionship. Be warned, it’s all about embroidery, and this is a post that only a stitching geek will love. As I fill out the last few pages of The Second Carolingian Modelbook, I’ve decided to take a stab at a design that seems to be everywhere. Except modelbooks, that is. 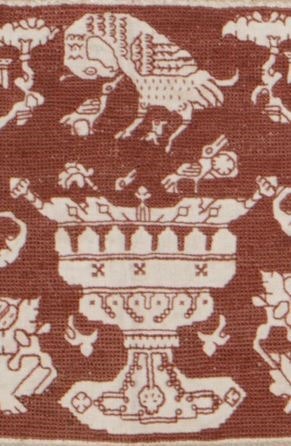 I call it “Pelican with Harpies and an Urn.” It is one of a set of patterns that crops up again and again in museum holdings worldwide, most often as a fragment. It’s clear that unlike many other snippets, these all came from different works, often executed in different styles or stitching media. I’ve posted about this before, but my collection of examples continues to grow, and with it, the general confusion level. The dilemma comes in because (to my knowledge) there is no existing printed pattern to establish a point of temporal or geographic origin. But there are lots of examples and they all express the details of the design slightly differently. Now if there was an authoritative point source that became unavailable, one would expect later iterations to be less detailed, or details to become blurred, through succeeding generations of copyist errors. 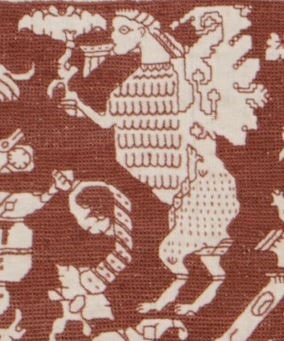 We can see that with the oft-studied “boxers” sampler motif in Colonial American samplers – which probably started out as a cherub bearing a flower, but over time became less specific and more stylized, until what remained was a barely discernable chubby humanoid with a club fist. But I can’t arrange the Pelican/Harpy/Urn designs in an ironclad continuum of graduated detail. Here’s the parade. The thumbnails are not clickable, please visit the links to see the museums’ higher resolution images. CH-1. First is this example from the Cooper-Hewitt’s collection (Accession 1931-66-144). They date it as being a 17th century work, but do not offer a provenance. 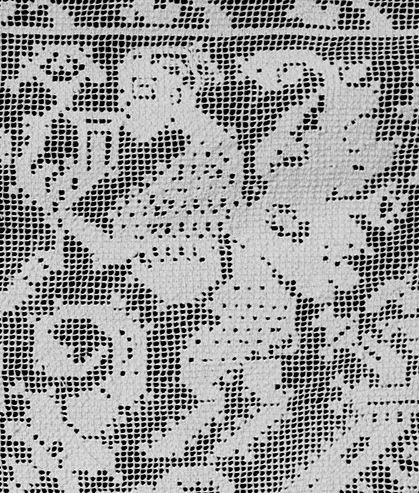 It’s done in silk on linen, with a characteristic tightly drawn background that produces the appearance of mesh, but does not involve withdrawn threads. Details are rendered in straight stitches, and may include double running or back stitch (it’s hard to tell without seeing the reverse). The museum acquired it in 1931, as a gift from Sarah Cooper Hewitt. CH-2. The Cooper-Hewitt has another example (Accession 1931-66-142). This one is specifically called out as being Italian, and is also dated to the 17th century. It’s a particularly prime piece because it is a full span cut across the end of the towel, cover or cloth it came from. We see the orientation, the top and bottom borders, and how the slightly different side borders framed the work. The museum acquired it in 1931, also as a gift from Sarah Cooper Hewitt. HERM-1. The Hermitage Museum has two examples. 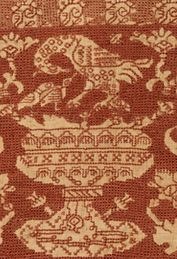 This one is entitled “Valence Embroidered with a Grotesque Motif (fragment),” but the on line page has no accession number. The full description calls out the linear stitching as being double running (Holbein), and the background as being drawn thread. They attribute it to Italy, and the 16th century. The museum got this piece in 1923, via the Stieglitz School, and ultimately from D. Flandin, an antiquarian dealer in Paris. MET-1. Yet another example in the same style. This one is from the Metropolitan Museum of Art (Accession 14.134.16a). The MET cites it as being Italian, and 17th century. Although this one is at a different museum, and is clearly not a separate piece of either artifact, there’s a connection with the two above. It was acquired in 1914, via the Frederick C. Hewitt Fund. HERM-2. On to another stitching style. 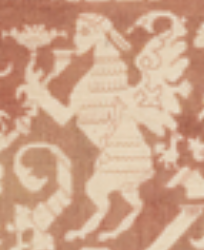 “Valence Embroidered with a Grotesque Motif” from the Hermitage also has no listed accession number. This piece is lacis (darned filet net). It’s dated 16th century and placed in Italy. Although filet work doesn’t allow for the linear details of the red examples above, it’s amazing how much fidelity to the design can be included. Like the other Hermitage piece, it entered their collection via the Stieglitz School Museum in 1923, but came from the collection of J. Kraut, in Frankfurt-am-Main. MET-2. More stitched net, and not another piece of the one above. This one is also from the MET (Accession 06.582). It’s cited as being Spanish, from the 17th century. This piece was acquired in 1906, via the Rogers Fund. First of all, I’d agree that the source for these was probably Italian, regardless of where the final objects were collected from. I’d also agree that very late 16th century, but more probably the early 17th century is reasonable for the whole pattern family based on the style, usages, media, and iconography, plus parallels to other contemporary designs. CH-1 presents the most detailed urn and pelican of the set. Both are encrusted with small linear features, although the placement of those features is not always symmetrical, nor is it identical from repeat to repeat. Feathers on the harpy’s body are shown in neat rows, but her wing feathers are very stylized, using right angles rather than diagonals. I’m unsure what she’s holding – a cup or panpipes (perhaps a fancy on my part, to think of that flower as the music of the pipes). From the patterning, it’s clear that the thing across her middle is her tail, wrapped up from between her legs. It’s hard to see clearly, but there are lots of differences between the urns and pelicans in CH-1 and CH-2 (blurry pix above). It’s clear that both have less detail. But one of Mother Pelican’s chicks has moved up near her bent head, and another now floats over her back. The nest detail seen in CH-1 is now symmetrical right and left at the top of the urn, instead of looking like leaves on one side, and scrolls on the other. The sprouts on either side of the urn’s bulbous body have changed attachment points, and now hang down, instead of growing up as pomegranates. CH-2’s harpy has retained her hairdo, but her wings are a bit more gracefully rendered, employing 45-degree angles to round off some of the shapes. Her feathers are more evenly spaced, but her tail is less pronounced, and whatever small markings covered her haunches have been lost in favor of more, smaller feathers. The thing she’s holding has lost its hatching, and now looks more like a cup than panpipes. She has also inherited another wayward pelican chick. MET-1’s urn is in between the other two in terms of detail. The nest/scroll unit at the top underneath the big pelican has transformed into a chick. The stitcher chose not to fill in the background in the loop defined by the pelican’s neck. There is something unidentifiable between the pelican’s legs, and her fathers are somewhat simplified compared to CH-1. The lower ornament is again descending from the bowl of the urn as leaves, rather than rising from the base. The harpy too has changed a bit. In this case, I’d say the sipped/sounded thing has parted company from the hand, and now looks more like panpipes, vaguely supported rather than held. She’s gotten a bit more balloon-like, and her breast feathers now march row by row. Her wings however have gotten a bit stunted, and return to a stepwise rendering similar to CH-1, but slightly more clumsy. The tail is suggested, and the haunches have been returned to stippling rather than feathers. OK. It’s clear that detail is going to be lost when you move from ornamented surface stitching to the negative/positive lacy mesh look of the all-white technique. But even so, a tremendous amount has been preserved. We see the plumage of Mother Pelican, and even some details on her brood (she’s managed to gather three of them together on top of the urn). Her nest is symmetrical. The urn preserves the shapes and proportions of the red stitched pieces, and has grown back the two small pomegranates that grow from the base. The harpy too preserves a lot of detail, down to the proportions and shapes of its flight feathers, and a bit of the detail inside of the wing. She’s lost some weight, although her hairdo is less detailed. Breast feathers are present, as is a pretty clearly defined tail. Stippling on the haunches looks different from the breast plumage, and her feet are now nicely shaped lion paws. The final example, MET-2, the Spanish piece, is a bit simplified. The harpy is less prominent, and the largest space is given over to the urn and pelican, and to the foliate ornament between the repeats. Mother Pelican’s brood is more suggested than rendered, although her feathers are nicely done. The urn has the two upward growing pomegranates emerging from the base. The harpy’s cup/instrument has become less detailed. It’s unclear what it might be. Her feathers have given way to geometric ornament, and her tail is suggested in shadow rather than being clearly defined. Her wings are somewhat like the Hermitage example’s, though. It’s worth noting that her proportions and body shape are more like CH-1 than the other examples. One other thing that’s of interest is the presence of the little filled boxes that bead the motif’s edges. You can see them along the curve of the pelican’s neck, along the harpy’s breast, and lower legs. They give a lacier appearance to the composition. I also find little protrusions like this to be extremely valuable as I stitch my motifs because they help me confirm counts and stay true to the design. Note that they are absent in the other renditions. Now, having our fill of urns and harpies, what can we say about them? It’s obvious that there is an as-yet unidentified but unifying source for this design. I posit that there might originally have been a broadside or model sheet that showed the composition. I guess that it may have been on the count, and that its broad outlines were used to establish the placement of the main design elements. But I don’t believe that it was followed exactly. Instead I think each stitcher used it to establish the first iteration of the design, filling in the details and roughly eyeballing their placement, taking inspiration rather than ironclad direction from the model. Once the first repeat was worked, subsequent repeats and mirrorings were copied from that, with no more call to look at the original. That’s why the baby birds wander around, while the relatively easy to place urn decoration remains more stable. Because of the different media and slightly different interpretations of the pattern (especially the pomegranates on the urn, and some differences I didn’t detail in the filler between the main motifs), my guess is that the same design branched into two slightly different but recognizable pattern “traditions,” which in turn spawned child works of their own. One of those traditions (marked by the upward pomegranates) made the leap from surface work to darned net. Now. Which came first? I can’t say. On intuition alone I’d go with the fat, balloon-bodied harpy (MET-1) being later than CH-1, and the two white filet pieces belonging to the same “tradition” as CH-1. That leaves MET-1 and CH-2 as child works of the other branch. Which came first? What chronological order can be used for these pieces? Aside from these idle thoughts, your guess is as good as mine. If you’ve managed to make it this far, please feel free to differ. Without detailed analysis or forensic investigations into fiber and dye, we’re all just speculating, anyway.